During the growing season, your turf needs an average of 1" to 1.5" of water per week from rainfall and/or sprinkling. You should water deeply, but not too often, since deep watering encourages deeper rooting and better health. It’s best to soak the soil to a depth of 6" each time, and you should try to water early in the morning to avoid evaporation. Give extra attention to hot or dry areas along pavement or in full sun, as well as slopes and hillsides. If your trees and shrubs don’t receive enough water this summer, they may end up wilting, losing leaves and suffering permanent damage. 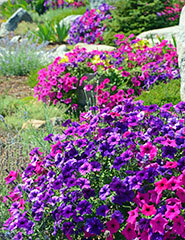 A long, slow watering once per week should be enough to keep them properly irrigated. Soaker hoses or low, wide-area sprinklers are ideal for watering your trees and shrubs during the summer, but be sure to leave them in place three times as long as you do when you water your lawn or flower beds. To enhance the quality of our clients' properties by focusing on beauty and value. To unsubscribe from this e-mail, please click here. 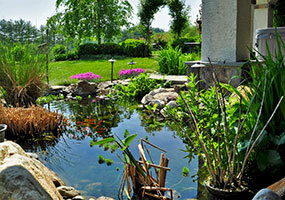 With numerous possibilities for adding plants and wildlife, ponds bring a whole new level of interest to the landscape. 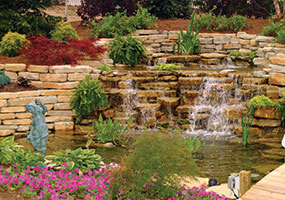 These versatile water features can be simple or spectacular and come in all shapes and sizes. Keep in mind that if plants or wildlife are to be added, you’ll need to consider the type of habitat they require. Situated in a pond or self-contained, fountains can provide a simple spray of water or a complex pattern of dancing streams. You can choose from all sorts of designs, including tiered fountains, cascading fountains incorporating statuary, garden wall fountains and even simple pebble fountains. Moving water is pleasing to both the eye and the ear, and a waterfall can make your property much more relaxing. Preformed waterfalls are available, or customized versions can be constructed using liner fabric, rocks, concrete and a pump. No matter how big or small your property or your budget, there’s a water feature option to suit every taste. Remember…even something as basic as a birdbath can have a big impact!